aims | "Keep Running Mummy!" 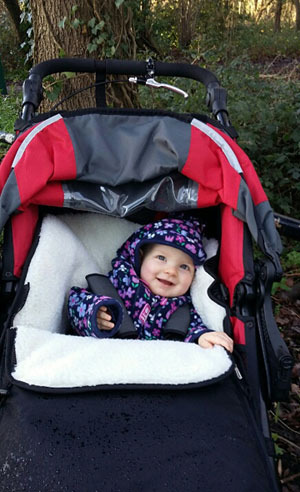 When my daughter was eight weeks old, I signed up to run a marathon. It must have been something to do with having just grown and given birth to another human being that made me feel so capable and empowered. The female body is amazing. I felt amazing! I was capable of committing to ­– and achieving – anything. In the months that followed, I gradually increased my running speed and distance (so far, so good). And then, as December gave way to January and the start of my marathon training, my resolve (having so far channelled my I’ve-given-birth-I-can-do-anything mentality) faltered somewhat. A marathon? Training to run 26.2 miles – this time with an energetic three year old and teething under-one year old along for the ride? Had I gone f*cking insane? What the hell was I thinking? At first, despite the fact I already had doubts, I felt the brave thing to do was battle on. Battle on, despite the fact I was soothing and feeding a baby back to sleep in the darkest hours of the night, rising at dawn to greet my son each morning and racing around after my little ones all day. Battle on, despite the fact I felt daunted by my 16-week training plan. Battle on, despite the fact I was dreading those runs getting longer. Dreading the additional exhaustion. Dreading the possibility that this would lead to me not being able to give my children all the energy, positivity and creativity they deserved from me. Now historically, I’m not a quitter. I’ve previously run two marathons. While training for both, I suffered setbacks. But twice I made it to the start line. Twice I crossed that finish line. And I loved them. The start of marathon training should be exciting. It’s a time of possibility and growth and determination. It requires commitment and dedication and guts. You have to be hungry for it. It’s taken me a few weeks to realise I’m just not hungry enough for it yet. To realise that the brave decision is not to battle on. The brave decision is to admit to myself – and everyone else – that I won’t be running this marathon. The brave decision is to quit. 1 Run a decent 5K with the running buggy. 2 Get a new 10K post-baby PB by April (sub-1:03:27). 3 Run a sub-60-minute 10K by June. So there they are: three challenges, all of which are more suited to my life right now. And you know what? I’m excited by them. The other great thing? These new goals mean I’ll get to spend a whole lot more time with my new favourite running buddy: my baby girl, whose babbling in the running buggy makes me smile and whose giggles spur me on. This entry was posted in Running and tagged 10K, aims, brave, family, goals, marathon, motherhood, quit, running, running buggy on January 13, 2016 by Claire.